What is brand architecture? Step back for a moment and look at your organization from the eyes of your customer. Is it clear how the various brand, product and service offerings fit together? Or is there an opportunity to improve the brand architecture to generate clarity, synergy and leverage? A strategic approach to portfolio management can help define how to structure the various brands and products to achieve these objectives. Brand alignment with customer requirements is the key to effective brand management. Through our brand consulting services, EquiBrand works with companies to organize and manage their branded offerings, with the overall objective of maximizing strategic leverage and increasing the value of the brand portfolio. What improvement opportunities within the current brand portfolio strategy and framework exist to better align with the marketplace? What types of brand development models should be considered? Should the company employ a masterbrand strategy or compete via individual brands and subbrands? Should a house of brands, branded house or hybrid approach be used? How many brands should be supported, and through what means? What strategic roles should each play and how should the brands work together as a team? Are there any gaps in the current product portfolio and how should these be addressed? How should a newly acquired brand be integrated into the existing brand portfolio? As a top brand strategy consulting firm, we have deep expertise in brand architecture development. Brand architecture strategy defines brand architecture (through several examples), lists key objectives, and provides an overview of key issues and considerations. Various brand architecture models (e.g., endorsed brands) are also described. Managing brand structure shows the various components to consider in developing the architecture, including a strategic audit, guiding principles, alternative models and brand naming decision tree. 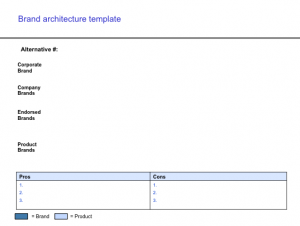 Included are sample brand architecture principles to demonstrate this important brand architecture component. Brand portfolio examples provides perspective on alternative models, types and approaches along the brand relationship spectrum. Examples include branded house, house of brands and endorsed brands, drawing on the automotive category. Brand architecture template includes practical tips for developing and evaluating brand portfolio alternatives, including pros and cons analysis. The template is designed to bring practicality and realism to brand architecture management vs. a more theoretical approach. As a top brand architecture firm, we employ brand architecture principles, processes, examples and best practices in assisting clients with brand portfolio management. Contact us to learn more.